With Littlest Pet Shop toys, kids can tell pet-lovin' stories their way. 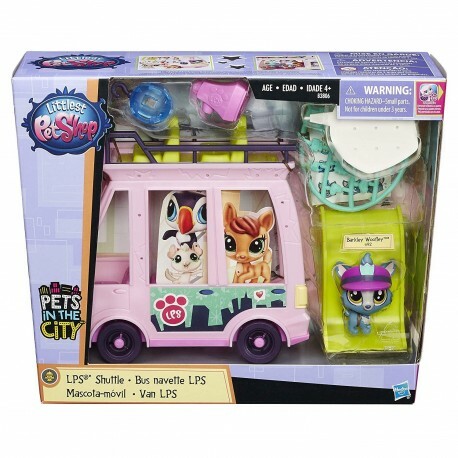 There are exciting neighborhoods to explore in Downtown City, and this colorful pet shuttle is a cool way for pets to cruise around and explore them all. From the beach to the park, uptown to downtown, kids can use this shuttle to take the pets where they want them to go, in style. This two-story bus is a cool place for pets to play. Take the pets on a tour through Downtown City in their very own double-decker shuttle. A disco ball and star-shaped banners create a real party atmosphere, and the emoji bubble lets everyone know what a fun time the pets are having! There's room for plenty of pets on this ride, too; the shuttle fits up to 5 pets and 5 pet friends. (Includes 1 pet; other pets sold separately.) Littlest Pet Shop and all related characters are trademarks of Hasbro. Decorate the LPS shuttle with Deco Bits pieces, accessories, and stickers for a custom look. Once the disco ball and star-shaped banners are in place, the shuttle will look like a party on wheels! How do pets exit the shuttle? On the awesome slide, of course! It attaches to either level of the bus, so pets can swoop down to their destination. With many ways to decorate, and room for many pets, there are so many stories that can be told when kids take their happy passengers to explore the delights of Downtown City. The LPS shuttle comes with 1 pet, a cute Yorkie pup named Barkley Woofley. He comes with his own hat accessory, and looks like he's ready to take the wheel and drive his friends through the streets in style.